One or more photo(s) has been virtually staged. Living in this open concept, airy villa with tons of windows/natural light is like living at a resort! 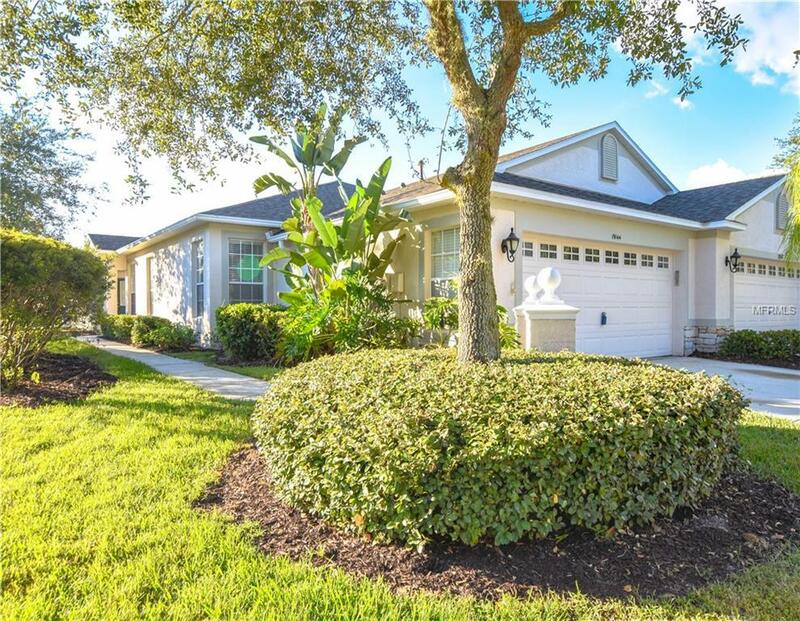 In a maintenance-free community with multiple pools, clubhouse, fitness center, parks, playgrounds, community activities, and so much more, this home is perfect for those who want to spend more time enjoying life! This three bedroom, two bathroom home is located in a gated community and sits on a gorgeous homesite. At the back of the home from the huge screened lanai, you can enjoy beautiful conservation views while entertaining or dining al fresco. The oversized master bedroom has a large ensuite bathroom with two closets (one walk-in), double vanity, separate soaking tub and glass enclosure shower, and private water closet. The master bedroom also has sliding door access to the lanai. Off the kitchen is a dining nook that overlooks the living room, making this villa feel as spacious and open as a single family home. Two bedrooms at the back of the home share the second bath. The inside laundry is right inside the home after entering through the two-car garage. Throughout the entire home, there is new, plush carpet. The ROOF was replaced in 2016. HOME WARRANTY transfers with the property. This home comes with ALL APPLIANCES including: washer, dryer, refrigerator, microwave, dishwasher, and range. AC recently cleaned, tuned, and coil replaced so is working well. Schedule a showing today! At this price this home will not last long! Additional Lease Restrictions The Hoa Voted in 2013 To Remove Any Rights To Lease The Homes in This Neighborhood So The New Owner Will Not Be Able To Lease/Rent The Property.